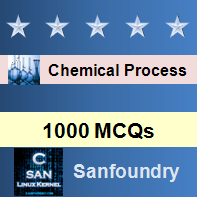 This set of Chemical Process Calculation Multiple Choice Questions & Answers (MCQs) focuses on “Limiting and Excess Reactant-I”. If the reactants C5H12 & O2 are having 2 moles an 8 moles of initial feed respectively. 1. Which is the excess reactant in the reaction? Explanation: C5H12 is the excess reactant as 1 mole of C5H12 = 8 moles of CO2. 2. Which is the limiting reactant in the reaction? Explanation: O2 is the limiting reactant as 1 mole of C5H12 = 8 moles of CO2. 3. How many moles of C5H12 are there when the reaction completes? Explanation: Moles left = Initial mole – extent of the reaction*stoichiometric coefficient. 4. How many moles of O2 are there when the reaction completes? 5. How many moles of CO2 produced in the reaction? Explanation: Moles produced = extent of the reaction*Stoichiometric coefficient. 6. How many moles of H2O produced in the reaction? 7. What is the extent of the reaction? Explanation: Extent of the reaction = (Initial moles – Final moles) / Stoichiometric coefficient. 8. What is the number of moles of the extent reactant in the reaction after completion? Explanation: Number of moles of CO2 left = 4 – 2.5 = 1.5. 9. What is the extent of the reaction? 10. What is the gms of CO2 produced in the reaction? Explanation: Moles of CO2 produced = 2.5 = Extent of the reaction.